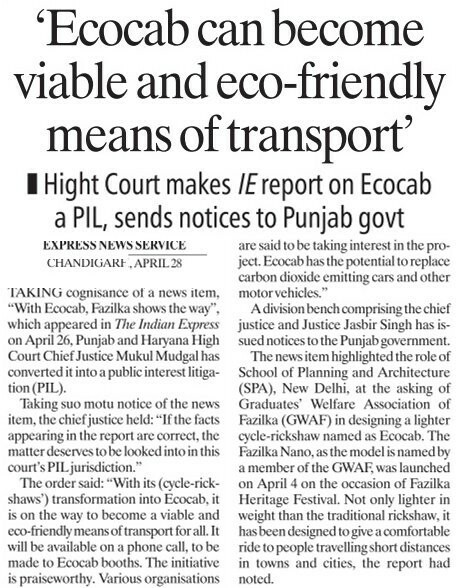 Taking cognisance of a news item, “With Ecocab, Fazilka shows the way”, which appeared in The Indian Express on April 26, Punjab and Haryana High Court Chief Justice Mukul Mudgal has converted it into a public interest litigation (PIL). A division bench comprising the chief justice and Justice Jasbir Singh has issued notices to the Punjab government. The news item highlighted the role of School of Planning and Architecture (SPA), New Delhi, at the asking of Graduates’ Welfare Association of Fazilka (GWAF) in designing a lighter cycle-rickshaw named as Ecocab. The Fazilka Nano, as the model is named by a member of the GWAF, was launched on April 4 on the occasion of Fazilka Heritage Festival. Not only lighter in weight than the traditional rickshaw, it has been designed to give a comfortable ride to people travelling short distances in towns and cities, the report had noted.